Cash Caper Classic Slot Review - Casino Answers! Cash Caper is a 5-reel, 3-line classic slot machine developed by Cryptologic, featuring free spins and a bonus game. You can play the Cash Caper classic slot machine at [Americans: Unfortunately due to legal restrictions you are unable to play at any of the online casinos this game is at. We recommend you trying playing the unique slots at Win A Day Casino instead.]. 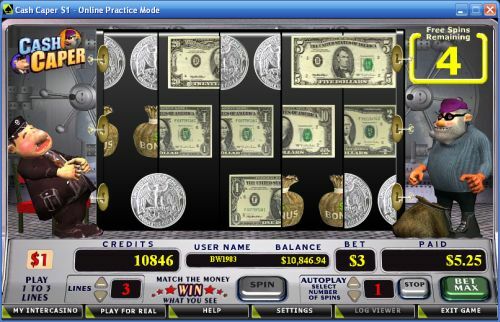 Cash Caper comes in two forms – a quarter slot and a dollar slot. You will have to choose which of the two you want to play before entering the Cash Caper slot game. You can select 1-3 paylines, giving Cash Caper a modest maximum total bet of $3 per spin. To play the Cash Caper online slot game, select the number of lines you wish to play and press the “Spin” button. You can also use the “Bet Max” button to play all 3 lines. The Cash Caper slot machine has a basic autoplay mode. You can use the Up and Down arrows to select 1-99 autoplay spins. To begin the autoplay mode on Cash Caper, simply select your bet and spin the reels as you normally would. To end the autoplay mode, you can press the “Stop” button at any time. Cash Caper brings originality to the classic slot, which is definitely a plus. Because it’s not like any slot we’ve seen, we would recommend that you try it out and see if you like it. To play the Cash Caper online slot game, make a deposit today at [Americans: Unfortunately due to legal restrictions you are unable to play at any of the online casinos this game is at. We recommend you trying playing the unique slots at Win A Day Casino instead.]! Can American players play the Cash Caper slot game for real money? No, if you are a resident of the United States, you cannot play the Cash Caper reel slot machine for real money at this time. For an alternative, we suggest that you read our Bust-A-Vault Classic Slot Review and play it at Bovada.